Sunstar Cricketers Ellyse Perry, Jordan Silk, Steve O’Keefe and Mitchell Starc have all had success in their own right during the past month with some prestigeous awards and fantastic statistics amongst the headlines. Ellyse Perry was named Player Of The Series after being the most consistent performer in the recently completely Commonwealth Bank Women’s Ashes Series. Ellyse amassed 286 runs at the incredible average of 95.3 and she also snared 12 wickets at an average of 25.5. This is yet another amazing feat added to Ellyse’s long list of achievements during her career. The Commonwealth Bank Southern Stars begin their ICC T20 Women’s World Cup Campaign next month in Bangladesh. Jordan Silk has capped off an impressive start to his season by claiming the highly prestigeous Bradman Young Cricketer Of The Year Award. 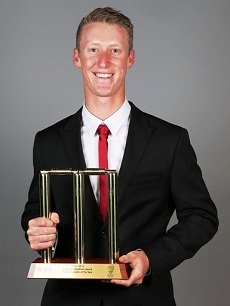 The Bradman Young Cricketer Of The Year Award is presented annually at the Allan Border Medal and it goes to a Cricketer under the age of 24 who is voted by current First-Class Cricketers over the previous 12 months as the most outstanding young player. In nine Shield matches in the voting period, Jordan scored 768 runs at an average of 42.67, adding a further 238 at 39.67 in the Ryobi Cup. “I was very surprised, there are a lot of good young cricketers’ going around at the moment and it was a great honour to win the award.” Jordan said. He also took one of the best catches you will ever see in a game of Cricket when the Sydney Sixers took on the Brisbane Heat in the KFC BBL. The catch went viral on social media channels and it has over 600,000 views on YouTube. It can be found here. Steve O’Keefe has been in the form of his career and is currently the leading wicket-taker in the Sheffield Shield after capturing 24 wickets at the impressive average of 22. He has also being playing a key role with the Sydney Sixers with their push to the finals in the KFC BBL although Steve unfortunately had a bad injury to his right shoulder in the last round game vs the Sydney Thunder and his come back date is yet to be finalised. We wish him well for a speedy recovery. Mitchell Starc has finally made his return to International Cricket after a long lay off due to a stress fracture in his back sustained on the Aussie’s Ashes tour to the UK. He is now back fully fit and is already starting to recapture the form which earned him a place in the ICC ODI Team Of The Year. Mitchell will soon be heading off to South Africa to compete for Australia in the T20I’s followed by the ICC T20 World Cup and IPL7.